This ukulele tuner is very fast, accurate and recognizes all strings using the built-in mic! Easy and perfect fine-tuning for all kinds of ukulele, such as Sopranino, Soprano, Concert etc. 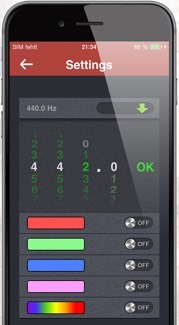 This app is developed by a guitarist and electrical engineer, thus it combines high usability and cutting-edge signal cessing. 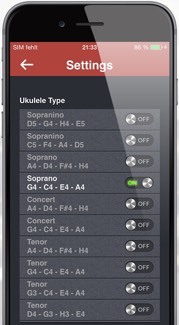 Simple Ukulele Tuner is easy to use and vides an aesthetic and custumizable user interface. High precision (apximately 0.1 %). Suitable for all kinds of ukulele. Stringtection: warning when tuning is out of range. Calibration: 430 – 500 Hz (0.1 Hz-steps). Display of exact frequency (in Hz). Display of frequency deviation (in Hz, marked by up/down arrow). 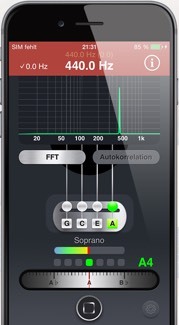 Gauge view of the detected tone (semitone) and octave. Spectral view (FFT - visualization of overtones). Configurable user interface (8 different themes). Developed for the iPhone and iPad (iOS 8.0 and above). As often misunderstood, pitch and frequency are not the same thing: while frequency is a pure physical quantity, pitch has to do with perception or psychology. Let's take an example: the A string of a standard ukulele has a frequency of 440.0 Hz. If you duce a pure sine wave with the same frequency (for example with Audacity), the result will sound artificial and sterile. How do we get the typical sound of an instrument - as for example of an ukulele? The keyword is "overtone": every string instrument (guitar, ukulele, mandolin, etc.) duces two different kind of tones: the keynote (thus the tone with the fundamental frequency) and multiple overtones. In addition, it often occurs that overtones are stronger (thus they have a higher amplitude) than the keynote. That's also a reason why frequency detection can be so difficult. 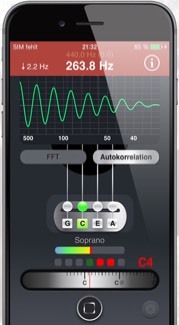 Please take into account that we talk about keynote (or fundamental frequency) when it deals with tuning an instrument (as for example with this IOS app)!